Based in Palermo, Sicily, the Ri.MED Foundation was founded in 2006 by the Presidency of the Council of Ministers of Italy and the Foundation is fully funded by the Italian government. Member partners also include: the Presidency of the Region of Sicily, Italy’s National Research Council (CNR), the University of Pittsburgh, and the University of Pittsburgh Medical Center (UPMC). The Ri.MED (Ricerca Mediterranea) Foundation has the aim of promoting, supporting and carrying out research leading to innovation in clinical practice in the fields of biotechnology, regenerative medicine, new drugs and vaccines, new-generation medical devices, and therapies for brain disorders. The objective is therefore to develop novel treatment and prevention strategies for diseases now afflicting humankind, while fostering economic well-being by creating jobs and business opportunities on the local, national, and international level. 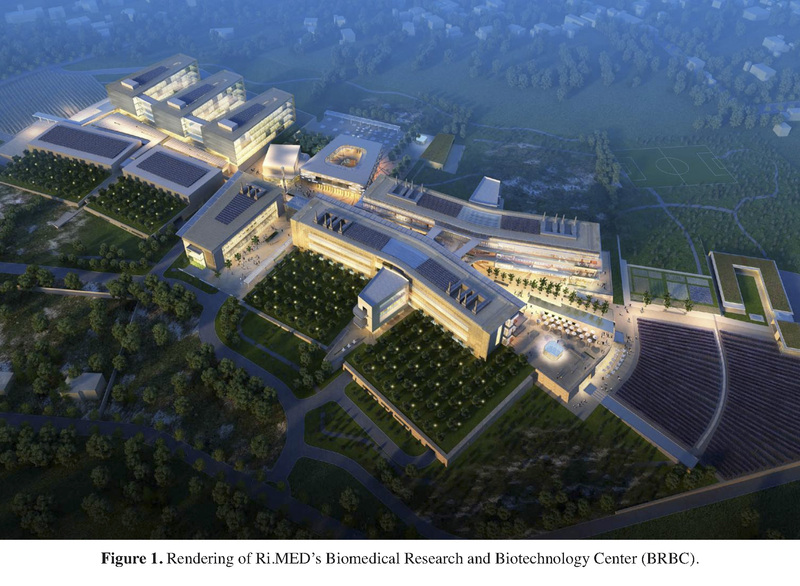 Biotechnology is one of the world’s fastest growing industries, and Ri.MED will help advance the biotechnology industry in Sicily and beyond through its Biomedical Research and Biotechnology Center (BRBC). BRBC is the first phase of a greater plan for a campus that could potentially include a medical school and a hospital. The center, located near Palermo in Carini, is expected to open by 2018 and will be composed of a state-of-the-art, 25,000 square meter laboratory building with research laboratories, centralized core facilities, and state-of-the-art equipment; facilities for pre-clinical in vivo studies; a corporate incubator designed to facilitate the creation of new startups and accelerate the time-to-market of new products and treatment techniques. Ri.MED scientists will be offered advanced and well-equipped laboratory facilities and the possibility to perform highly competitive research projects, that will be evaluated only for their merit and translational potential. 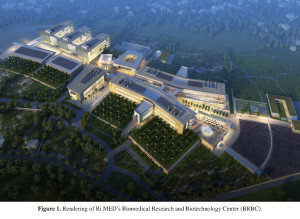 In this direction, the Ri.MED Foundation’s BRBC will also help Italy to retain some of its best medical and scientific talents and attract some of the world’s top researchers to Palermo. • Structural biology. Understanding the 3D architecture of macromolecules is essential to study diseases’ molecular bases and for drug design and analysis. Proteins, RNA and DNA are able to create protein/protein or protein/nucleic acid complexes, move inside or outside cells, and perform their tasks thanks to their ability to coil into a specific 3D structure. Comparing normal conditions with pathological ones can highlight structural differences in the macromolecules, detect the causes of the diseases, and suggest potential approaches. X-ray crystallography and state-of-the-art technology supported by bioinformatics, allow BRBC researchers to carry out advanced studies on molecules that have not yet been characterized three-dimensionally, and that are of interest for other programs of the Center. • Computational biology. This branch of science offers essential support to many biomedical and biotech disciplines, as well. The computational use of all known data on molecules and their structure can generate predictive models providing data on the causes of diseases and suggesting target drugs. Computational biology reduces costs, experiment time and efforts required to confirm the accuracy of hypothetical models. At BRBC, many opportunities will be available for collaborations between computational biologists and other biologists involved in experimental research programs that may significantly benefit from computational biology. • Drug discovery. The most innovative approaches to develop new drugs do not focus their research on a single molecule but use data acquired from structural and computational biology, bioinformatics, genomics and proteomics to design and develop drugs with structures that can modify the behavior of specific molecules causing diseases. These areas of research offer important information to predict/evaluate the effectiveness of a given drug. Besides identifying therapies that strongly target the causes of a disease, biotechnologies have also paved the way for “customized” drugs to treat specific patients (i.e. with certain genetic characteristics) at the right time, with great benefits to their health. At BRBC, molecular biology knowledge and innovative molecular screening and synthesis methodologies will be implemented to identify and validate new molecular targets playing crucial roles in diseases, and to rapidly produce compounds that may be used as effective drugs. • Vaccine development. The first vaccines that stimulated the immune system and increased protection against selected diseases were based on inactive or weakened viruses unable to cause diseases but that increased immunity towards subsequent exposition to the viral strain of the pathogen. Today, vaccines can be based on recombinant proteins acquired inserting in proper vectors genes that encode pathogen-specific antigens. These are recognized as foreign proteins by the host’s immune system cells that do not react against the proteins and also attack the infective microorganisms in the process. Recombinant vaccines are safe and relatively easy to produce and preserve. Using the most innovative and effective approaches, BRBC scientists will develop vaccines capable of fighting emergent infections. The vaccine development program will involve scientists from different fields committed to infectious disease research, with particular reference to epidemic diseases. The program will include research on infective agents that can be potentially used as weapons for bioterrorism. Research will be carried out in high-security BRBC laboratories designed for the treatment of pathogens with high risks of infection. • Development of biomedical devices. Nanotechnologies have strongly influenced the development of biomedical devices that can be introduced in the human body to sense and therapeutically manipulate target physiopathologies. Research plans at BRBC include developing highly efficient devices that deliver drugs in cells, removing toxins, restoring the body’s mechanical functions (e.g. sphincters, valves, alveoli), and sensing and adjusting hormone levels (e.g. insulin levels). These devices will use DNA as an electric conductor, nanoparticles as nanosensors, and will rely on molecular “motors” to move “materials” inside and outside the cells. • Regenerative medicine and tissue engineering. Through multiple technological approaches including tissue engineering, this line of research will stimulate the regeneration of certain cell populations and re-establish the structure and functions of malformed, damaged or degenerate tissues and organs. For this purpose, the program will make use of the significant progress recently achieved in the culture and isolation of diverse cellular histotypes, in stem cell identification (totipotent, lineage-specific, inducible, etc. ), and developing new biomaterials and scaffolds with different structural and biological characteristics. The tissue engineering approaches in which cells are associated with biomaterials involve the cooperation of biologists and bioengineers in the research of 3D biocompatible matrices for appropriate exchange of nutrients and gasses, and integration of the engineered product in the surrounding tissue. • Molecular imaging. Non-invasive imaging allows to identify molecular damage leading to diseases, molecular evolution of diseases and their possible treatment. Research at BRBC will involve the expression of individual genes and the visualization of intracellular processes: the observation of the gene expression of living subjects through (MRI) is a rapidly developing technology that will allow BRBC researchers to monitor the status of therapeutic gene delivery in the brain and other parts of the body. Researchers will utilize in vivo and non-invasive imaging methods to visualize the duration of expression of specific genes in a tumor, allowing an immediate test of sensitivity or resistance to chemotherapeutic drugs. This program will utilize static and functional MRI to monitor infiltration of immune cells into transplanted organs to detect the earliest signs of rejection thus improving the management of transplant recipients. • Neuroscience. Neuroscience activity at BRBC will focus on how the brain develops and how the nervous system can degenerate. This program will use powerful methods and technologies to visualize normal brain structures and functions at the cellular and molecular levels, and better identify the abnormalities that cause neurodegenerative disorders. Researchers at BRBC will study how the brain structure gives rise to behavior, mood and emotions. This knowledge will help develop plans of care to prevent and treat neurodegenerative and psychiatric disorders. The foundations for creating a world-class research centre and biotech industry in Sicily are already being laid. Since 2008, Ri.MED has provided intensive postdoctoral training fellowships in each of the BRBC’s eight research lines to a select group of researchers. These Ri.MED fellows are set to form the core of the future BRBC research team. After an initial research period at the University of Pittsburgh, Ri.MED fellows may choose to continue with research in other centers in Italy and elsewhere in Europe, a process that is also designed to facilitate the creation of a strong international research network. Annual Ri.MED symposiums held each year in Palermo have become an important appointment for young researchers and international experts to discuss the latest developments in biomedical research and biotechnology. Ri.MED can leverage on the University of Pittsburgh’s strong track record in the promotion of public health and its position at the forefront of biomedical research. The University of Pittsburgh has numbered among the top 10 recipients of funding from National Institutes of Health (NIH) since 1997 and ranked sixth in fiscal year 2011. UPMC is also one of the top 10 hospitals in the United States, according to the 2012 ranking of the U.S. News and World Report. The University of Pittsburgh and UPMC will support the Ri.MED Foundation in setting up the BRBC, supplying know-how and management experience and guaranteeing the coordination of research activity. The Italian government and the University of Pittsburgh have already joined forces to offer state-of-the-art health care in Sicily, and planning for the BRBC began in 2005 after the Italian government and UPMC saw the positive results of their public-private partnership at the Palermo transplant center known as ISMETT (Istituto Mediterraneo per i Trapianti e Terapie ad Alta Specializzazione). Over the past decade, ISMETT has become one of the leading organ transplant centers in Europe and a major referral center for other Mediterranean countries. The ISMETT hospital will provide one of the clinical venues in which Ri.MED discoveries may be tested. In conclusion, Ri.MED’s BRBC represents a significant investment in biotechnology on the part of the Italian government. The center will offer a unique opportunity to develop novel treatment and prevention strategies for diseases now afflicting humankind. This initiative has the potential to significantly foster economic well-being, creating jobs and business opportunities on the local, national, and international level, while also helping Italy to form and retain some of its best medical and scientific talents, besides attracting some of the world’s top scientists to the region. The development of medical products and devices will provide a basis for future growth of Italy’s biotechnology industry (including companies directly spun-off from BRBC discoveries and inventions, as well as the center’s intellectual property, which would be licensed to other companies, both nationally and internationally). This will also represent also an opportunity to develop the venture capital industry in Sicily, by earning a reputation as a region with the available resources and capabilities to attract new businesses.